President Hadi has reportedly offered the Chinese government the opportunity to manage the port of Aden. WHO, UNICEF, and Yemeni organizations have immunized 2.7 million children across the country. Since it was first reported in October 2017, the disease has spread quickly, killing more than 70 people so far. Secret negotiations have been taking place in Riyadh between the Houthis and the Saudis, the Houthis’ spokesman said today. Residents of Hadhramawt protested UAE’s interrogation and unlawful detention of their relatives. Riyadh's new migrant rules have pushed tens of thousands of Yemenis out of jobs and back to a country on the brink, with disastrous results. According to Al Arabiya, the Houthis have recruited school students after major losses in Marib, violating humanitarian law that forbids the drafting of child soldiers. A new “urgent” agreement was announced between the Hadi government and the Southern Transitional Council. According to Yemeni press sources, Hadi agreed to remove a number of military officer from the Presidency Protection Unit whom the UAE sees as close to the Muslim Brotherhood. In return, the Transitional Council agreed to stop calls to bring the Hadi government down. Ahmad Lamlas has been appointed as the Secretary General of the Southern Transitional Council. In an effort to buoy the weak currency, Saudi Arabia announced that it plans to deposit $2 billion in the Central Bank of Yemen, according to the Saudi Press Agency. Previous injections of capital into the bank have had no positive effect on the economy, according to experts. Tribesmen blocked Yemen’s international highway to protest rising prices in locally manufactured oil products. The World Health Organization (WHO), UNICEF and national health authorities have completed a large-scale vaccination campaign to control the spread of diphtheria in Yemen. 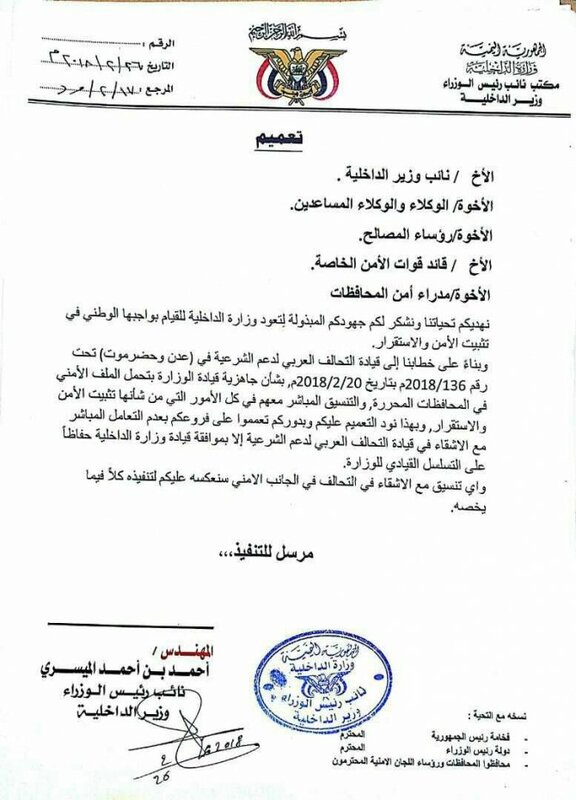 Tensions might escalate between supporters of Islah and southern Yemenis after President Hadi annexed Bihan military zone from Shabwa to Marib Governorate. Southerners claim this move paves the way for the Islah party to take over Bihan. The governor of Socotra passed away on Friday morning. No further details were reported on the cause of death. President Hadi appointed the half brother of ex-president Saleh, Ali Saleh al-Ahmar, to head the government’s reserve force. UAE announced that its anti-AQAP operation “Sweeping Torrent” has succeeded in Abyan province. President Hadi appointed Sayf Al-Qafish as the commander of the 115th brigade. A dispute over the port of Berbera in Somalia has raised tensions between Djibouti, Somalia, Yemen, and Ethiopia, with the UAE accused of bypassing formal government consent and taking advantage of the fractured political context to take control of the port with its company, DP World. Tribal forces from Shabwa have been mobilized and are on the move towards Ateq (the capital) to demonstrate against Hadi’s recent decision to annex Bayhan in Shabwa to Marib.